This cottage can only be rented when its' bigger neighbor (the Luxury Beach House) is not rented. Available for monthly inquire. 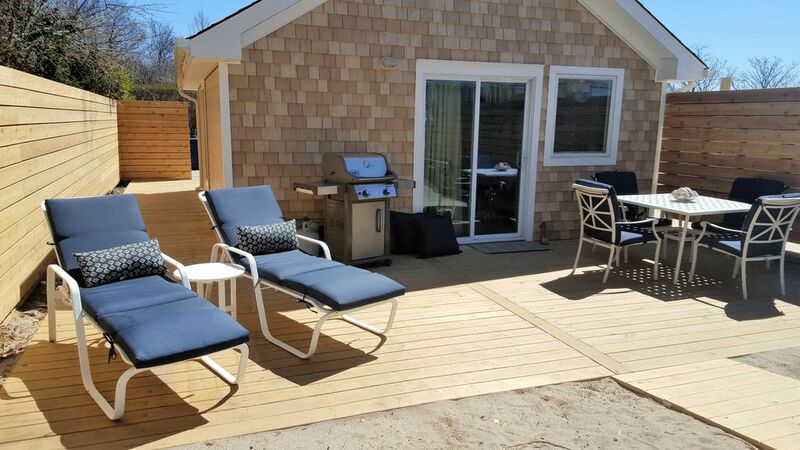 Brand new affordable beach cottage located directly on the beach! This adorable 1 bedroom beach house is perfectly located right on the beach, with a large patio, gas grill, lounge chairs and outdoor dining area for 4. There are beautiful water views from inside and out. The cottage is all new. Everything fully furnished, towels and linens are there for bring your clothes & food. So many amenities- free wifi and cable TV, kayaks, stand up paddle board, paddle boat, fishing poles, small dingy, all amenities included. Full bathroom as well as a new outdoor hot & cold shower. Boat and vehicle parking 2 spots, 5 Star restaurant is right across the street. Everything you would possibly need is here for you. Our Beach Cottage is the perfect getaway. Being able to relax on the beach while remaining close to all the action is ideal for any vacation. This home is only minutes away from Long Island's vineyards, East Wind Spa, Long Islands famous farm stands, Atlantis Marine World, Tanger Outlet Mall, Skydiving, and much more. If you have the urge to go to the Hamptons or Montauk you can easily do straight road will take you to both. If experiencing New York City is what you'd like to do, it's only an hour and a half away. Being able to see it all is what makes our Long Island Beach Houses the perfect getaway. We are known for being #1 Bachelorette party or all girls weekend getaway as well as family reunions and weekend getaways because we are only 1 1/2 hr from NYC and five minutes to where the long stretch of vineyards begins. If you are having a wedding out east this is the perfect place to house your guests. We have multiple properties on the same beach (neighboring houses that we rent) so we can accommodate as many people as you need. If you want to stay on Long Island, on the beach and make NYC part of your plans we can give you the best places for your holiday! Hello, let us introduce ourselves, we are Virginia and Debbie. Partners in life as well as Beach House owners and managers of these amazing properties. About seven years ago we found our dream on the beach in Wading River. It was a little beach house that needed a lot of work although you would never know that now looking at it lol. When we both decided we should rent here and there some weekends etc.. We were both worried about letting people in our home but now we absolutely love sharing our beautiful beach house and meeting such fabulous people. Our neighbors caught on to us and asked if we could help them and so on, and so on and so on... Now we are up to twenty five homes and loving every minute of it. We have the best locations and everything you would need to enjoy your stay! A five star restaurant right down the street, just walk over and enjoy an amazing dinner or a drink. What about the fact that most of our homes come with kayaks, bikes and fishing poles to better enjoy your stay on the beach. Our Beach Houses are the perfect getaway destinations. Being able to relax on the beach while remaining close to all the action is ideal for any vacation. All our homes are only minutes away from Long Island's Vineyards, East Wind Spa & long Islands famous farm stands or Atlantis Marine World, Tanger Outlet Mall, Skydiving, and much more. If you have the urge to go to the Hamptons or Montauk, you can easily do so. One straight road will take you to both destinations within 25 minutes. If experiencing New York City is what you'd like to do, it's only an hour and a half away. Being able to see it all is what makes our Long Island Beach Houses the perfect getaway. We are known for being #1 Bachelorette party or all girls weekend getaway as well as family reunions and weekend getaways because we are only 1 1/2 hr from NYC.If you are having a wedding out east this is the perfect place to house your guests. We stayed 2 times at the cottage in the past years and we absolutely loved it,,, it’s just the right size and a just a 5 second walk to the beach,,!! Virginia and Debbie were so nice they, we were welcomed to the home with a nice bottle of wine,,!! We loved spending time with family, building memories at the lovely cottage. It was so quaint and relaxing! We hope to return in the future! You don't need anything just bring your stuff, CAR, groceries and just relax!!!!! Thanks for everything Ginnie & Debbie, hope see you soon. We'll cook ceviche next time. Adorable cottage, very clean, and comfortable. Great views of the water from the kitchen table and outdoor patio. Debbie and Ginnie could not have been any nicer and accommodating! Looking forward to our next trip up there! Clean, relaxing and lovely. We will return. Amazing beach cottage for a weekend get-away! Newly renovated, steps from the beach, comfortable & clean. The owners are nice and accommodating! They make you feel right at home. Our Beach Houses are the perfect getaway destinations. Being able to relax on the beach while remaining close to all the action is ideal for any vacation. All our homes are only minutes away from Long Island's Vineyards, East Wind Spa & long Islands famous farm stands or Atlantis Marine World, Tanger Outlet Mall, Skydiving, and much more. If you have the urge to go to the Hamptons or Montauk, you can easily do so. One straight road will take you to both destinations within 25 minutes. If experiencing New York City is what you'd like to do, it's only an hour and a half away. Being able to see it all is what makes our Long Island Beach Houses the perfect getaway. We are known for being #1 beach getaway as well as family reunions and weekend getaways because we are only 1 1/2 hr from NYC.If you are having a wedding out east this is the perfect place to house your guests.